This tutorial explores a technique used in the game ABZU for rendering and animating thousands of fish using vertex animation and static mesh instancing. In Godot, this can be accomplished with a custom Shader and a MultiMeshInstance. Using the following technique you can render thousands of animated objects, even on low end hardware. We will start by animating one fish. Then, we will see how to extend that animation to thousands of fish. We will start with a single fish. 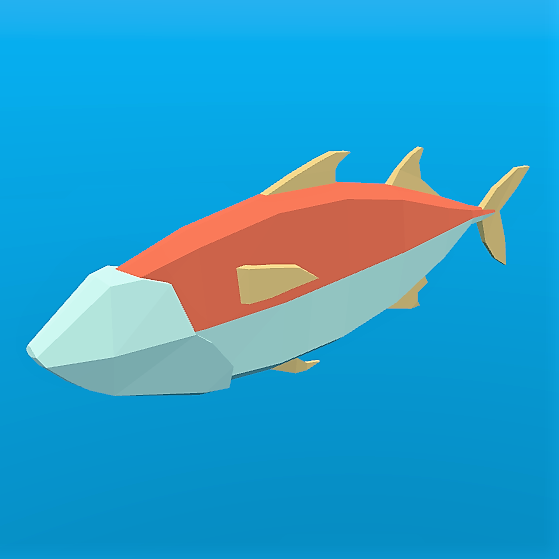 Load your fish model into a MeshInstance and add a new ShaderMaterial. 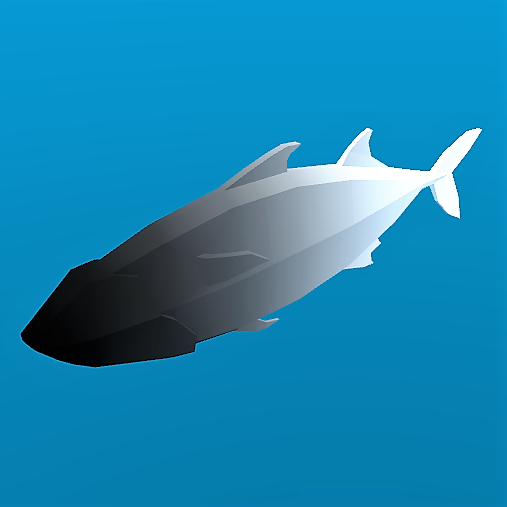 Here is the fish we will be using for the example images, you can use any fish model you like. Typically, you would use bones and a Skeleton to animate objects. However, bones are animated on the CPU and so you end having to calculate thousands of operations every frame and it becomes impossible to have thousands of objects. Using vertex animation in a vertex shader, you avoid using bones and can instead calculate the full animation in a few lines of code and completely on the GPU. All the code for the animation will be in the vertex shader with uniforms controlling the amount of motion. We use uniforms to control the strength of the motion so that you can tweak the animation in editor and see the results in real time, without the shader having to recompile. All the motions will be made using cosine waves applied to VERTEX in model space. We want the vertices to be in model space so that the motion is always relative to the orientation of the fish. For example, side-to-side will always be move the fish back and forth in its left to right direction, instead of on the x axis in the world orientation. In order to control the speed of the animation, we will start by defining our own time variable using TIME. The first motion we will implement is the side to side motion. It can be made by offsetting VERTEX.x by cos of TIME. Each time the mesh is rendered, all the vertices will move to the side by the amount of cos(time). Next, we add the pivot. Because the fish is centered at (0, 0), all we have to do is multiply VERTEX by a rotation matrix for it to rotate around the center of the fish. And then we apply it in the x and z axes by multiplying it by VERTEX.xz. The next two motions need to pan down the spine of the fish. For that, we need a new variable, body. body is a float that is 0 at the tail of the fish and 1 at its head. The next motion is a cosine wave that moves down the length of the fish. To make it move along the spine of the fish, we offset the input to cos by the position along the spine, which is the variable we defined above, body. This looks very similar to the side to side motion we defined above, but in this one, by using body to offset cos each vertex along the spine has a different position in the wave making it look like a wave is moving along the fish. The last motion is the twist, which is a panning roll along the spine. Similarly to the pivot, we first construct a rotation matrix. We apply the rotation in the xy axes so that the fish appears to roll around its spine. For this to work, the fishes spine needs to be centered on the z axis. If we apply all these motions one after another, we get a fluid jelly-like motion. Normal fish swim mostly with the back half of their body. Accordingly, we need to limit the panning motions to the back half of the fish. To do this, we create a new variable, mask. mask is a float that goes from 0 at the front of the fish to 1 at the end using smoothstep to control the point at which the transition from 0 to 1 happens. For the wave, we multiply the motion by mask which will limit it to the back half. In order to apply the mask to the twist, we use mix. mix allows us to mix the vertex position between a fully rotated vertex and one that is not rotated. We need to use mix instead of multiplying mask by the rotated VERTEX because we are not adding the motion to the VERTEX we are replacing the VERTEX with the rotated version. If we multiplied that by mask we would shrink the fish. Putting the four motions together gives us the final animation. Go ahead and play with the uniforms in order to alter the swim cycle of the fish. You will find that you can create a wide variety of swim styles using these four motions. Godot makes it easy to render thousands of the same object using a MultiMeshInstance node. A MultiMeshInstance node is created and used the same way you would make a MeshInstance node. For this tutorial, we will name the MultiMeshInstance node School, because it will contain a school of fish. Once you have a MultiMeshInstance add a MultiMesh, and to that MultiMesh add your Mesh with the shader from above. MultiMeshes draw your Mesh with three additional per-instance properties: Transform (rotation, translation, scale), Color, and Custom. Custom is used to pass in 4 multi-use variables using a Color. instance_count specifies how many instances of the mesh you want to draw. For now, leave instance_count at 0 because you cannot change any of the other parameters while instance_count is larger than 0. We will set instance count in GDScript later. transform_format specifies whether the transforms used are 3D or 2D. For this tutorial, select 3D. For both color_format and custom_data_format you can choose between None, Byte, and Float. None means you won’t be passing in that data (either a per-instance COLOR variable, or INSTANCE_CUSTOM) to the shader. Byte means each number making up the color you pass in will be stored with 8 bits while Float means each number will be stored in a floating point number (32 bits). Float is slower but more precise, Byte will take less memory and be faster, but you may see some visual artifacts. Now, set instance_count to the number of fish you want to have. Next we need to set the per-instance transforms. There are two ways to set per-instance transforms for MultiMeshes. The first is entirely in editor and is described in the MultiMeshInstance tutorial. The second is to loop over all the instances and set their transforms in code. Below, we use GDScript to loop over all the instances and set their transform to a random position. Running this script will place the fish in random positions in a box around the position of the MultiMeshInstance. If performance is an issue for you, try running the scene with GLES2 or with fewer fish. Notice how all the fish are all in the same position in their swim cycle? It makes them look very robotic. The next step is to give each fish a different position in the swim cycle so the entire school looks more organic. One of the benefits of animating the fish using cos functions is that they are animated with one parameter, time. In order to give each fish a unique position in the swim cycle, we only need to offset time. We do that by adding the per-instance custom value INSTANCE_CUSTOM to time. Next, we need to pass a value into INSTANCE_CUSTOM. We do that by adding one line into the for loop from above. In the for loop we assign each instance a set of four random floats to use. Now the fish all have unique positions in the swim cycle. You can give them a little more individuality by using INSTANCE_CUSTOM to make them swim faster or slower by multiplying by TIME. You can even experiment with changing the per-instance color the same way you changed the per-instance custom value. One problem that you will run into at this point is that the fish are animated, but they are not moving. You can move them by updating the per-instance transform for each fish every frame. Although doing so will be faster then moving thousands of MeshInstances per frame, it is still likely to be slow. In the next tutorial we will cover how to use Particles to take advantage of the GPU and move each fish around individually while still receiving the benefits of instancing.